The technological advancements of recent years have allowed architects to design and create buildings that would have been unthinkable in previous generations. Architects such as Zaha Hadid, Frank Gehry and Rem Koolhaas have revolutionised the practice of architecture and challenged people’s perceptions of precisely what a building is, and how it should look. In our latest article, we celebrate these advancements, with five iconic examples of contemporary architecture. The Blue Planet is the largest aquarium in Europe, containing 7 million litres of water, 53 aquariums and displays and over 450 different species of fish and sea creatures. However, it is the design, rather than the size, which really distinguishes The Blue Planet. The building is designed to mimic the swirling fluidity of the ocean through a series of curved wings. Seen from above, The Blue Planet is designed to look like a whirlpool, while the exterior is clad in a shimmering fish-scale-like aluminium. The Seattle Central Library is among the most innovative and unique libraries ever built. The various sections of the library are arranged across five platforms and four ‘in between’ planes, each serving a variety of functions, a highly intuitive design which gives the building its distinctive faceted shape. The library was designed by a dream team from OMA, including lead architect Rem Koolhaas, Joshua Prince-Ramus and Bjarke Ingels who would later go on to found his own firm, BIG. The building was extremely well received, with visitors to the library doubling in the first year of its opening. The Central Library was also distinguished with many awards, including the 2005 AIA National Architecture Award 2005. 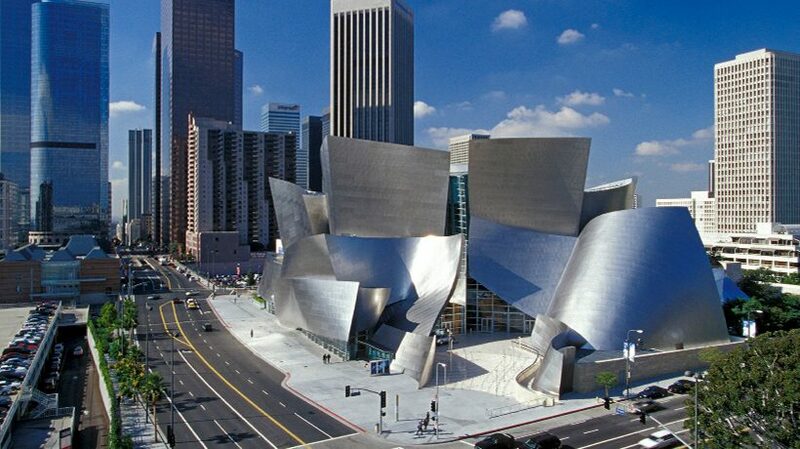 The Disney Concert Hall is one of the most iconic and polarising buildings ever built. This mini-Guggenheim actually predates its more famous Bilbao counterpart in concept, but delays, funding issues and political interference meant it wasn’t built until 2003, six years after Guggenheim, Bilbao, and 12 years after Frank Gehry first submitted his designs. Despite the numerous delays (the project was even cancelled in 1994), the end result is a stunning piece of architecture, emblematic of Gehry’s post-structuralist aesthetic with its weird blend of geometric shapes and sweeping metallic surfaces. Perhaps Zaha Hadid’s most iconic building, the Heydar Aliyev Cultural Center may not have a particularly catchy name, but its design is unforgettable. The 619,000-square-foot design is a fluid, free-flowing marvel of a building which blends organically with the surrounding space. The design won the London Design Museum award in 2014, and cemented its designer’s reputation as the ‘Queen of Curves’. One of the strangest and most ambitious designs of recent years, Rem Koolhaas’s CCTV Headquarters building succeeded in revolutionizing the concept of the skyscraper when it was opened in 2008. Built to contain the TV studios, offices, broadcasting and production facilities of China Central Television (CCTV), the building is a trouser shaped, looped design, with the two 44-storey towers united by a 75- metre cantilever. CCTV Headquarters was OMA’s first major building in China, and is now a distinctive feature of the Beijing skyline. We’re passionate about architecture and design and our team would love to hear from you to discuss your next project. Simply get in touch.